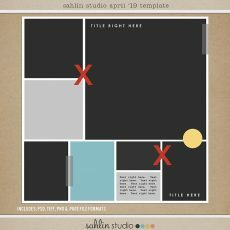 Welcome to the LAST Day of the SahlinStudio.com Grand Opening GIVEAWAY Event! I hope you’ve had a bit of fun, and liked having an opportunity to score some cool prizes. 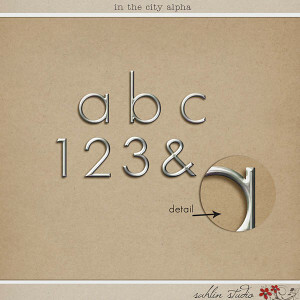 And as a thank you, you can receive a FREE exclusive gift, “In the City alpha” just for signing up for Sahlin Studio Insider. Also, be sure add the new SahlinStudio.com to your Blog Readers or Feed Burner accounts. FINAL GIVEAWAY | One LUCKY person will receive $100 Sahlin Studio product. Would you like to have a nice shopping spree in the Sahlin Studio store? 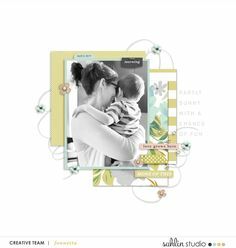 Take a look at the wide variety of digital scrapbooking supplies in the Sahlin Studio shop. 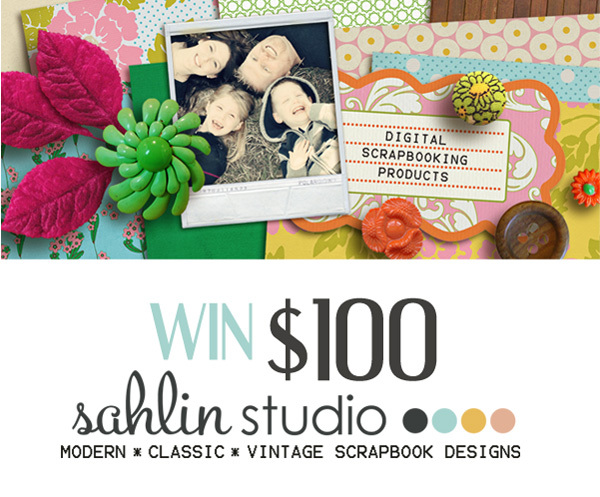 To be entered to win a $100 Sahlin Studio product Gift Card drawing please leave a comment. Your entry must be posted by 11:59EST Thursday, March 1. Winner will be announced shortly after. Good luck everyone! The best price of all! I hope I’m the lucky one! Thanks for the chance!! I love your stuff and would love to be the winner of the gift card! Thanks so much for the chance to win! Whoa! Nice giveaway! Thanks for the chance to win! What a huge gift!! So many great prizes this week, thanks for all the fun! $100…Wow! Count me in. I love your stuff. Wow! That’s a great prize! Thanks for the chance to win. oh wow, count me in for sure!!!! And thank you! wow! i adore your stuff! thanks for the chance to win! By far my favorite designer! Thanks for the chance to win! Heck yeah! That would be fantastic. Thanks for the chance to win! What an amazing prize! I love your stuff, so thanks for the chance to win! What an awesome chance! Thanks so much Krista and congrats on the new site–it looks great! wowowow!! such a generous offer… thanks for the chance ♥ !! What a great give away! That would be a super-fun shopping spree. That would be a FANTASTIC prize! I have a lot on my wish list 🙂 Thanks so much for the chance to win. So exciting !!! Love your designs; just bought the worn collab. Thanks for the chance to win!. Wow that’s an amazing prize! Thanks for the chance!!! Wow what a generous give away! I love your products and your new site looks great 🙂 Thanks for the chance! A $100! Wow, you’re very generous!! Thank you SO MUCH for this chance!!! OMG!!! Really fantastic prize!!! I love your stuff, so thanks for the chance to win! Wow so so generous! Congrats on the new site – looks great! I already have a lot of your stuff but this is an amazing gift away. Thank you so much for a chance to win, and even I don’t win. Wow! This would be amazing to win! Your stuff is wonderful! Wow… it would be so awesome to have a shopping spree in your shop! Thanks for the chance to win! Wow, just wow! I have just discovered you in the last few months and have been slowly building up my collection. Thanks for this opportunity. This is the best prize ever!!! I am crossing my fingers and toes. wow! i thanks for the chance to win! What an amazing give away. I love your designs…thanks so much for the chance! How awesome- I hope I win! Wooohooo that´s great 🙂 Thank you very much for the chance to win. OMWord! I would love to win this! I LOVE your stuff! I’m off to buy your latest collab right now, as a matter of fact! Would love a shopping spree. Your collection is amazing! Thanks for the chance to win! I love your designs and this would be amazing to win! Wow, what an amazing giveaway! Your designs are always beautiful so pick me!! Your designs are incredible and love your new site! Thank you so much for the chance to win. You are only my FAVORITE designer, so… heck yeah! Bring on the $100! YOU ARE MY FAVORITE DESIGNER!!!! I WOULD LOVE TO WIN A BIG STASH OF YOUR DESIGNS!!!! OH YEAH!!! What a great giveaway! Thanks For the opportunity to win your great designs. I love your designs as well – great giveaway!! Holy cr*p… what an awesome giveaway… idie if I would win this!!! Thanks for the chance!! Thank you for the chance to win! I would love to win some of your products. They are gorgeous! Oh Oh, one hundred dollars, waves hands in the air and points to self saying pick me, pick me. A chance to win $100 at a great store count me in! I just love your product. I’m going to keep my fingers crossed! I hope I win. Good luck to everyone posting your comments. WOW what an awesome giveaway! Thanks so much for the chance and good luck everyone. Oh my Gosh!! Would I love a shopping spree to Sahlin’s Studio? You bet I would! Thanks for the chance at such an awesome gift!!! Pick me, pick me! I love your designs, thank you for the chance. Wow! Awesome, a shopping spree!!! How fun!! Love your designs!!! How did I miss this whole week ? Better late than never, sign me up! wow…love your products! thanks for this awesome giveaway! Congrats on the your grand opening! I always look forward to your releases. Your stuff is always beautiful! Thanks for the chance! Love your product, thank you for the chance to win! It would be so fun to win – I have a brand new wee little one that’s two weeks old, and with three other kids, well, no scrapping mojo has graced my life as of late. Having new beautiful goodies to scrap with just might change that! Wow…what a GENEROUS giveaway…I want to win! What a great prize!! and what a beautiful products You have !! Oh, that would be an OUTSTANDING giveaway! Thanks so much for the chance to win! What a fun prize! Thanks for the opportunity to win, and congrats to the winner, whoever you may be!! This is the bestest prize ever!! I am double crossing my fingers in hopes of winning…. WHOA! This would be a DREAM come true! holy maceroni, gotta take this chance! awesome! Yay – your great stuff for free – what a prize! Thanks for the chance to win! Holy Smokes! What an awesome and generous giveaway! Thanks for the chance Krista! Ooooh! A shopping spree at Sahlin Studio? Fairytales do come true, and I hope it happens to me! Thanks for the opportunity your new site looks great! What a great giveaway! I love your supplies…they are awesome! I L-O-V-E your style and would be ecstatic to win this! This is SUPER! AH-mazing stuff…love it. Thanks! I love your items! I hope I win! Thank you for the chance at a very exciting giveaway! Hoo! I could do some damage with that! Thanks for the chance!! Congrats on your new site! I’m a big fan of your work. Would love the chance to win. Thank you!!! 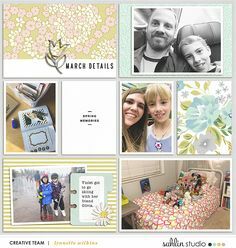 Your designs are my favorite “pinterest”! This is such an awesome gift! So excited! Crossing my fingers!!!!! Thank you! Congratulations on your new site! I love your designs and look forward to seeing all your fabulous new products. Wow! What a huge giveaway! Thanks so much for the chance, and congrats on the new site!! I would LOVE a shopping spree in your store, Krista. Do you think you could throw in 100 hours of free time so I could do nothing but scrap? Ohhh what a cool prize!! Keeping fingers and toes crossed!! Thank you! Love the new fresh site! This would be awesome to receive thanks for the chance! Wow… that would be an amazing prize. 😀 Great grand opening. Congrats again to you! How fantastic, thank you for the chance! You’re so generous! Thank you so much for the chance to win. I would love to win! I lufe your stuff! Thank you so much for the chance! Wow. What a shopping spree. oh my gosh, what a wonderful giveaway….THANKS for the chance to win!!! Sahlin Studios is quite new to me, but I love it all. Thanks for the chance to win your beautiful kits. How exciting!!! I absolutely love your designs!!! Thanks so much for the chance to win!!! Wow! What an amazing prize! Your products are gorgeous! I would love to win. Thanks so much for the chance! WOW! This is so generous! Thanks for the chance! OMGoodness … Definitely the best prize of all! Love the new site and your work. Thanks for the opportunity. Wow, what an amazing giveaway! Thanks for the chance! Wowzers, what a fan-tabulous prize, Thanks for the chance to win. Thanks for the chance to win, that is a HUGE prize! :) Love all your things, beautiful design and quality.. Thanks again for making today fun! Have loved your designs since I went digital. Granted it’s not that long, but a girl’s got to start somewhere! Thanks for all your generosity. wow thanks so much for the gooorgeous opportunities!! would love to be able to reate pages with your designs! they’re so unique and special! This is extremely awesome! I am NEVER THIS lucky, but here’s hoping for a change! Thank you for this chance. No matter what, I think it’s nice that you are going to make someone very, very happy! What a great gift! I would be able to clear out my wishlist!! Thanks for the chance. How very generous of you! I would love to win. The new site looks so fresh and clean! What’s not to want from your store? 🙂 Love your new “Worn” kit. Just beautiful. Thank you for this generous giveaway! I LOVE your designs!! huge fan here! 🙂 would LOVE to win! I have loved your stuff from the very beginning and this is an awesome prize! Thanks for the chance! What a great give away! Thank you 😀 Love your new site too. Crossing my fingers!! Thank you for the chance to stock up on your beautiful and functional scrapbook designs!! oh my gosh! what an amazing giveaway! thank you! I love your stuff so much! (huge fan) and would love to be the winner of the gift card! Thanks so much for the chance to win! It would be so great to win and have tons of new cute kits to scrap with! Awesome! Thanks! This is the best give away of all! Wow! What an incredible grand opening! Thanks for the chance to win your amazing artwork! I like the new site! What an awesome prize! Ooooo, pick me, pick me! Of course, I own just about everything already, so this would be *future* goodies for my stash! This is soo nice!! Thanks a lot for the chance, I’m a great fan of your designs!! Wow, I’m a fan and this chance can turn in a dream come true! Wow, what a super awesome, generous giveaway! I would just LOVE to win since your one of my favorite digital designers…keep the great designs coming!!! OMG! What an amazing prize!!! Such an AMAZING giveaway! Wow! I would love to win! Thank you so much for the chance! I’m in love with your beautiful products! You are my favorite designer and inspire me a lot! Thank you for this amazing giveaway! $100!!! Oh, the fun I could have shopping your designs… Thank you for doing this! What an incredible gift to whoever wins! Oh, WOW! Thanks for a chance! Wow! how generous of you! Thanks and Congrads on the new page. Hmmm…$100. Wonder if it would take me longer than 5 minutes to spend in your store? I doubt it! Thank you for the chance to win this generous gift! I LOVE your stuff so $100 of it would be awesome!! Thanks for all the fun this week. 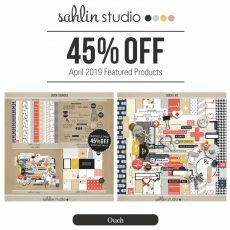 That would be fantastic – to win $100 worth of products from Sahlin Studio!!! Awesome … I love your designs … thanks for the chance to win! Thanks for the chance!!! I love your creations! This would be a dream come true! Love all your stuffs!!! Thanks for the chance to win! Great prize – can’t wait to see who wins it! Thanks! To win this shopping spree would be a dream come true! What a super prize!! Thanks for the chance to win!!! I would LOVE to win! I would LOVE to win!! 🙂 Thanks! WooHoo! What an awesome giveaway! You are an amazing designer Krista and I would seriously scream my head off if I won this! What a DREAM shopping spree!!!! Oh my gosh! Thank you so much for the opportunity to win. I love your work. I really love your stuff! Thank you for the chance to win! Wow such a generous giveaway. Thank you for the chance to win! Thanks for the chance! Love your new site!!! I just bought a bunch of stuff from your store, but I could easily spend $100 more! I just started scrapping not too long ago, and your designs are by far the best that I’ve seen. Thanks so much for this opportunity! WOWZERS! $100? Yes, yes please… more Sahlin in my scrap folder would be a very very wonderful thing! Thanks so much for this generous giveaway!!! Now you got me speechless!! Oke oke…wowzers, this is really an amazing price, would really really really love to win, thank you so much for being so sweet and generous!!! thank you so much for a chance to win this awesome gift! I could buy alot of kits with this! Oh my goodness I would love to win!!! This is such an awesome giveaway…thanks for the chance!! This is such an awesome gift! Too generous. Love your stuff! Thanks for the opportunity to play. So happy for your new home! I, too, am a huge fan of your work, and would love to expand my currently (pretty huge!) stash! Love it all! Wow, the big giveaway! This has been a lot of fun, and I love your new blog. Thanks for all these great giveaways! Oh my how I would love to win!! Your stuff always so great! Thanks for the chance! Somebody is gettin lucky!!!! Such an awesome treat. Wow! What an awesome giveaway! Love your stuff and I can’t even imagine the fun I’d have with $100 of it!!! Wow, what an outstanding gift. Thank you for the chance to win it, but I think I won’t have any chance. Wow that is an amazing prize. What fun for someone! Wow! What an amazing prize! Thank so much for the opportunity! Such an amazing opportunity! Thank you for the chance to win. Love your new site! Thanks for the chance to win! This is awesome!! Thanks for the chance to win!!! Wow, I had to scroll a lot to get all the way down. I am a big fan of your work and just love your style. Great new site! Awesom giveaway, thanks a lot. The level of detail is very much appreciated. I just love your kits. Thanks for the chance to win. I would love the chance to win! I have so many things on my wishlist! Thanks for the chance! Wow! What a giveaway! My mind is reeling just thinking of all of the wonderful goodies $100 could buy. Thanks for the chance to win! Oh, my!!! What a giveaway! You are so generous! Thanks for the awesome chance! Ooh, I would love your awesome kits hanging in my digi-stash closet when choosing for a layout! Wow! Thanks for the chance to win!! Thanks for the chance to win!!! I love your kits. Love your designs – what a great prize! Thanks for the chance. Have followed you since you became a designer. Love your goodies! You are so generous with this giveaway. Thanks for the chance to win it. woohoo-amazing! Thanks for the chance to win, I could easily spend it. Such a huge fan! WOOT! Definitely saved the best for last!! I would LOVE to celebrate my birthday early with a Sahlin Studio gift card :D!! Your new site looks beautiful! Congrats, and thanks for the amazing giveaway. My daughter and I would love a nice shopping spree. Love. Love. Love your stuff. You’ve got it goin’ on girl! Such and awesome give away! I love your stuff! Thanks for the chance! What an awesome giveaway. I love your products! Thank you for your generosity and the chance to win! Wow, awesome! Thanks for the chance to win! Crossing fingers, crossing fingers! Your stuff is gorgeous, and thanks so much for a chance at such a fabulous prize! I just love the combination of bold color saturation and a clean crisp style. Great contest! Congrats on the new site! Are you kidding me?! This is absolutely amazing – and soo generous! Thank you so much for the wonderful week! And a big huge congrats on the fresh new site! Are you kidding…. sign me up… love all your designs! Oh someone has to win – can it be me? WOW!! what an awesome giveaway! !..thanks for the chance to win. Choices…a gallon of gas or one of your scrapbook kits….I will stay home and scrap! I Love all of your stuff. LOVE the new site! Thanks for the chance at this amazing prize~! Wow, what a great giveaway!! Thank you so much for a chance! I love your products! What a great giveaway…you’re so generous! Love your stuff!!! Thanks for the opportunity! LOVE your things! Fantastic giveaway. You have some lovely stuff. Can’t even imagine all the cool stuff I could get with that, what an amazing prize! Omg what an awsome give-away!!!! I’ m never that lucky but a girl can try,right!! Thanks for a chance!! You are awesome! I love your stuff and always look forward to new releases! omg, what a chance ! Thank you !! Oh my gosh… I would wet my pants if I won! Thanks for the opportunity, your work is beautiful. I am not a lucky person as such, but I figured if I don’t win, I have no chance, if I do I have 1 in about 260? LOL! Not such a big chance, but I’ll keep my fingers crossed to increase the chance to win. Sorry for any typos, really hard to type with the crossed fingers 😉 Thank you for this chance! Have a nice day! Congratulations on the new turn in the road! I love that you design with so much variety and ecletically. It is wonderful and I adore your work. oh please oh please oh please let me win!!! Thanks for the chance! I would ABSOLUTELY LOVE to win this gift certificate! Thanks for all of the giveaways! If I won I would just die! Thanks for the chance to win, and I am loving the new look. Love, love, love your stuff! Even though I have a ton of it, there’s still plenty more I could splurge on. Happy Weekend! I love all your designs! $100 wouldn’t be enough to buy all the designs I have on my wishlist but it’s a great start!Thanks for the chance to win! This is such a generous prize. Thank you for the chance! What an incredible prize! I have such a huge wish list!!! Thank you for the chance! Awesome giveaway! I would feel like I won the lottery if I won this one. You’re a fabulous designer. Eeeekkkkkk!!!! 🙂 TY for the chance! Wow! What fantastic prize! Thanks for the chance! What an awesome giveaway! Thanks so much for the chance to win so much of your beautiful stuff! Love your stuff! What a generous giveaway! I didn’t see my earlier post that I tried to do, so I hope I’m not duplicating! Thank you! Thank you for the opportunity! Love your work! I would LOVE to win the GC! I love your stuff so much!! thank you for this awesome opportunity! What a wonderful gift you are offering! Thank you for the chance to win. WOW! What a generous giveaway! Thank you for the chance to win! This is such a great giveway! I love the new site, and the celebration. My Birthday is March 1st. I just told my hubby not to worry about getting me anything (we are paying down our debt) because I am feeling good about this giveaway! Best wishes to everyone and thanks for doing this! Your giveaway is awesome. Thanks for the opportunity. It will be very easy to spend!! So generous, thank you for the chance! Good luck everybody!!! WOW!! Very generous!! Thanks for the chance!! You truly have a gift of design. I love everything you make. Thanks for the chance to win such a great prize!! Yippy! Skippy! I would love to win. Thanks! aaaaaaahhhh my mind is totally blown thinking of all the fun I’d have with a nice $100 of your stuff! Awesome! What a gracious contest! Love your designs,thanks for the chance to win! omigoodness!!!! this is a dream come true giveaway!!!!! i just adore your designs and love anticipating your latest and greatest!!!! Oh just think of all the goodies I could get! This is the best prize, thanks for the chance to win! Besides liking your designs, they inspire me! You are incredible. Your products are amazing and I would love a shopping spree! You’re awesome! I had a hard time finding this at first, so I am glad I found it now! Thanks for the chance! I really like your plastic alpha! What an awesome giveaway, thanks so much for the chance. What a great prize! The hardest part would be deciding which goodies to get! Thanks for the opportunity! OH EM GEE! How generous of you! Thank you for this awesome chance! That would be so awesome!!! Love your stuff!! Love it all – so gorgeous – and super excited to be in the chance to have more goodies – thank you!! I love your stuff! Thanks for everything you do. Oh i would LOVE to win that! i love your Products! WOW! this is awesome, krista! Oh wow, that would be a dream prize for me!! My wish list is full of your products. Thanks for the chance! Wow, what a beautiful and generous prize. I’d love to win. Thanks for the chance! Dreaming of all the amazing layouts I could do if I won the prize. Love your products! Gosh what a great give away! Love your designs!! Great designs. Thanks for the chance to be a lucky scrtapper. Ooo I love your designs!!! Your kits are so amazing and versatile!!! Thank you soo much for this fantastic chance!!! Yes, what a wonderful prize… I wouldn’t even know where to start… the kits I have I use all the time so I would have to go back a ways I think…. and just get the lot lol! Thanks for being so generous Krista! The new site is really fantastic. Good luck with everything. What a shopping spree that will be! if I am the winner. Wow! Thanks for the chance. The new site looks awesome. oh my goodness what an awesome chance! thanks for such an amazing give-away. Woooow!!! What a great prize! Thank you for the chance! If I won I would feel like Charlie and the Chocolate Factory! Wow. oooo…What an incredible giveaways! You rock Krista! Oh, what a COOL prize that would be! It would be totally AWESOME to win and be able to buy some of your great items. What fun they would be!! This is just too cooll!!! I ReaLLy want to WIN!!!! What and awesome giveaway. Thank you so much for the opportunity to win, I love your designs! WoW! what a generous offer. It would be so great. What a fantastic prize! Thanks for the chance. Congrats on the new website! Thanks for the chance to win! Love your stuff!! Website looks great! Lots of fun goodies! Good luck with your new venture – the website is awesome! Thanks for the chance to win. I love all the products and designs! 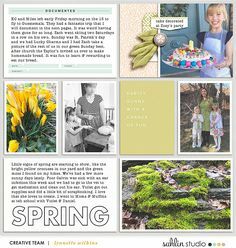 Great inspiration to create wonderful designs! WOW – I would love to win!!! WOW! What an exciting giveaway! I LOVE your new website and, of course, LOVE your products! You’re fabulous, girl! Thanks for the wonderful opportunity! Wow!! How exciting, what a wonderful chance to win fantastic designs, thank you for the chance. I would be thrilled to win the $100 gift certificate to your store. I just love your stuff! Oh my, I have so much of your stuff already- not sure I could spend $100- but I sure would have fun trying! Eeeh! I know I don’t have a shot at winning, but this is amazing!!!! Thanks for this giveaway!!!!! I would love to have a shopping spree at your store. I love yourdesigns! Oh wow, that would be some shopping spree! I love your stuff, that would just make my week!